My 'make it up as you go along' recipe for Kofta Kebabs worked! Not the best plated up pictures in the world but you get the idea. There I was in work on Monday filling up the meat fridges when I spied kebabs and so felt the need to be making them. Once again I read the back of the packet to see what they'd put in and went home with a mission to make them. Must say, I was really pleased with the result and will make these again. I cooked them on my amazing electric griddle thing - perfect! But you can of course use a grill pan. Turn them a couple of times so they cook evenly. When they are nicely done and cooked through serve straight away. I served them with pitta bread that I'd put on the griddle before the kebabs. Along with a lemon wedge, shredded white cabbage, onion, tomato, cucumber and a couple of pickled chilli peppers (shop brought in a jar). The dipping sauce was a hot pepper sauce - again shop bought. If you are going to cook these on a BBQ soak the skewers in water for an hour beforehand. I'm not too sure if they would fall apart though on a BBQ - I did have to be careful turning mine. You will need a food processor/whizzy thing. Tear the slice of bread in half - leave the crust on it wont matter. Whizz for a few seconds till you have breadcrumbs - remove and set aside. Now quarter the onion and throw that in along with the garlic cloves and whizz that up till the onion is chopped nice and small. Now put in the minced lamb but only whizz for a few seconds as you don't want it too whizzed up or it will go all horrid and paste like - we don't want paste like yuk! In a large mixing bowl put in the onion and garlic the egg yolk, rose harissa paste, garam masala and cumin. Give it a good mix and then add the minced lamb along with 5 tablespoons of the breadcrumbs and a squeeze of lemon juice. You need to mix it together to even out the spices and combine it all. Just be careful not to get carried away mixing or as I said before, the lamb will go like paste. When your almost done, season with a little salt and pepper and add the parsley to the mixture. I found that 5 tablespoons of breadcrumbs was fine but if you think your mixtures is too sloppy - if you've paid attention it shouldn't be! but if it is then you can add a little more of the breadcrumbs. Divide the mixture into 6 and using your hands mould it around each wooden skewer keeping them all the same size and shape. You can take a little of the mixture and fry it - give it a taste then you'll know what you want more of. I usually do this but couldn't actually be bothered so took a chance and they were perfect. Now get them cooking. Interesting concept, Jan. They sure do seem simple to prepare and I'm liking the blend of flavors. Another keeper! You've got them spot on Jan - you have some great ideas! That's brilliant, Jan, you made these kebabs simply by reading the back of the packing!!! 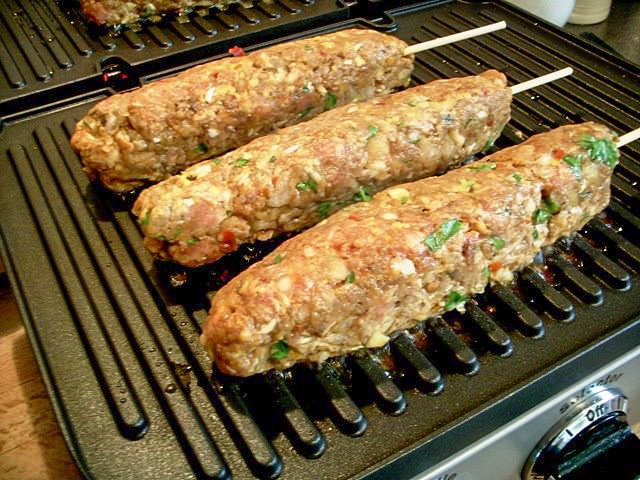 These kebabs u made look delicious! Thanks for sharing^^. Those look fantastic Jan! I have never had a Kofta, but can see it's about time I got with the program! You are such a great cook! I like to look at the packaes in M&S and figure out how to do it myself as well! These are just perfect for barbecue season Jan. These do look good! And easy and simple. looks delicious - I really like eating kebabs but am terrified of the commercial versions you find outside - you never know what's lurking. Homemade ones are so much better. Was lovely to meet you today Jan! These kebabs sound really tasty. I have been looking for more ways to use harissa. The lamb kofta kebabs look wonderful - perhaps I should pop these onto my bbq this weekend. OH MY GOD...I made Simit Kebab (Turkish) this week, look much like yours. We have the same cravings...yummy! Great job, Jan. I bet these were yumptious. 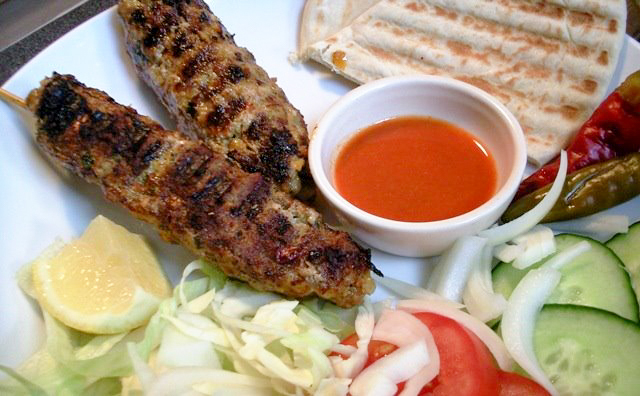 Wow...The lamb kofta kebabs look yummy. This is new for me, tomorrw i will try for breakfast.